Every spring at Epcot Walt Disney World Resort, the theme park blooms with color and inspiring shapes as the International Flower & Garden Festival takes over. 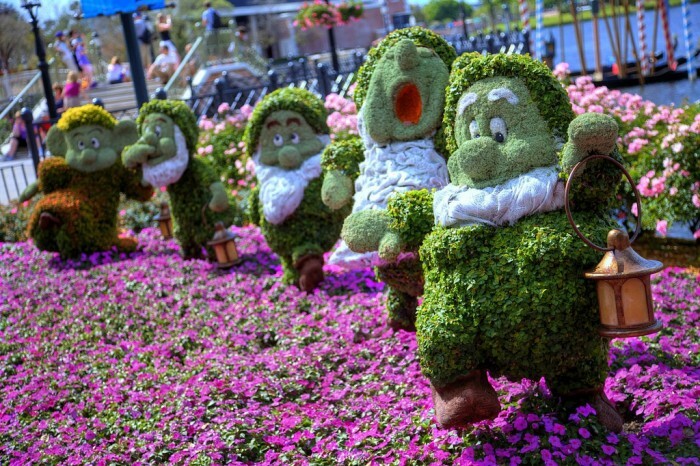 This event typically runs from the beginning of March until the end of May, and it allows flower lovers and Disney guests to delight in a seasonal explosion of brilliant blooms and interactive exhibits. There’s entertainment, farm to table cuisine, children’s playgrounds and more in addition to spectacular flower arrangements and gardens. The annual celebration is vibrant and a treat for the senses, and it has 3 weeks left to captivate those who live or can travel to Florida. While you revel in an abundance of flowers, enjoy main dishes, desserts and drinks from more than a dozen stations scattered throughout the splendid showcase. Each weekend of the Festival, from Friday to Monday, take an imaginary trip back in time through the sounds of classic hit songs performed at outdoor concerts offering waterfront views. As you tap your toes to the tunes of the past, dine on delicacies that were especially chosen for this springtime event. Get a guaranteed seat to view the concert and sample tasty plates made from local fare. Display after display of flowers made up to represent the finest topiaries and gardens in the world are yours for the viewing. Gaze upon exhibits that feature living sculptures, each shaped like a beloved Disney character. Guided tours of the displays and gardens, special appearances by gardening gurus, kid-friendly fun and more await until May 29th. Then, Epcot returns to normal until next year. Learn more about the Epcot International Flower Festival by visiting the Disney website. Spring Brings the Epcot International Flower Festival to Walt Disney World Resort Georgia’s International Cherry Blossom Festival Coming This March! The 2016 Boston Flower and Garden Show Coming This March! International Flower and Trade Expo 2016 in Kenya this June!